Nomad is a company that sells footwear for women and children. They have tons of cute flats, heels, boots, and sandals. For my review, I had trouble deciding what shoes I wanted because there were so many cute ones. Here is some information about the company: Nomad Footwear has continued stay true to the origins of their company, passionately striving to create shoes that not only provide comfort, but also original styles and versatility to all of its loyal customers. Creating fashionable sandals, flip flops, flats and rain boots that any free spirited-girl would love to journey in. I finally decided on the Bedazzle flats in black which retail for $40. I chose these because they are cute and I can wear them to work. They are comfortable and can be worn with pants, a skirt, or a dress. They also come in brown and plum colors. Also love these Myrtle heels! The giveaway will be for any pair of shoes from Nomad footwear under $55 to one lucky winner. The giveaway is open until Midnight on Tuesday July 26th. Winner will be chosen on Wednesday July 27th using Random.org. The winner will have 48 hours to respond or a new winner will be chosen. **US residents only! Visit the Nomad Footwear website and let me know which pair of shoes that would like the most! -Like Nomad footwear on Facebook (2 entries). -Follow Nomad on Twitter (2 entries). OMG.....just one favorite??? Well, I'd have to choose the Izzy! Total red rocker pumps! Too cute with jeans!!!!! I would love the flats call Street in size 10. I would like the Spruce shoes. I like the Alaska Rust Boots the best! i like the zen sandals and the swingset sneakers. I need a cute pair of flats. Glad I dropped by and saw these! Hi! Just stopping by. Following you from the Catch a Wave Wednesday. Would love a visit and follow back on my blog: blog.writerslairbooks.com. Thanks! I would love the Puddles - Turquoise Monet rain boots! Too cute! I like the Diamond Pink Sandals. I like Nomad on FB as Anne Loyd. I follow Nomad on Twitter as Anneliz702. I would love to get the Myrtle heels in grey! hi, arrived here from I ♥ Blogging Hop and followed you via gfc. hope you'll have the time to follow back. I love their rain boots! The Puddles in Black Paisley are my favorite. I like the Izzy in Red. I like the Glimmer - Black. Style # : W7890-Brown Flats. I'd like the Snug in natural pink. I just love the Yippy - Black/Zebra Leopard. They're fun! i like the Serena heels in black. I love the "Topaz Black." I like serena and izzy styles. I like you on facebook @ A marie hj saver. I liked the Bend in gray. I would love to enter to win a pair of the cute dress satin flats. Wow - I would either get the Aloha in Black or the Alaska in Rust! I could use both! I actually love the Myrtle heels also. 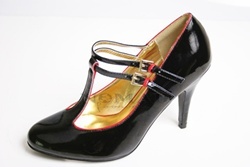 But I also like the Satin flat in black. Thanks!